A dragon slayers weapon is an incredible piece of lethal art. Just look at the Bloodied Dragon Axe, it looks like a decorative piece of art, but it is covered in fresh dragon blood! Never underestimate the lethality of this weapon. The cast metal haft of this decorative hand axe is crafted to look like a vicious, hissing dragon. A spine-like bar runs across the top of the stainless-steel axe head, to which the bloody steel spike poll is attached. The bit of the axe head has been etched with the anguished image of a skeletal hooded figure and is covered in blood colored red enamel. The handle of the axe is made from rubber and is fitted with a small blade of steel at the end, which is also covered in blood-colored enamel. 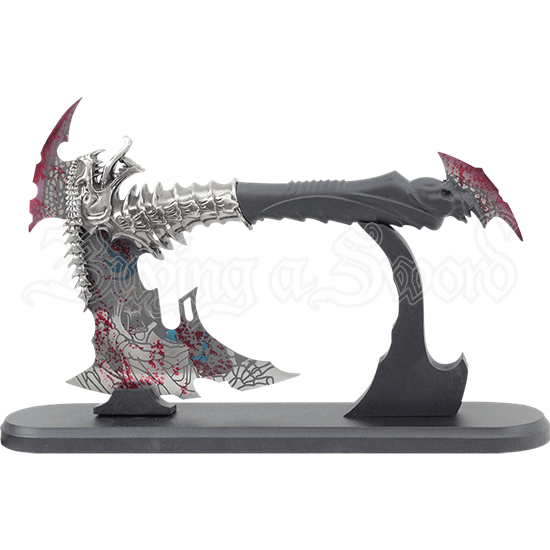 Decorate your home with this incredible piece of fantasy weaponry, or give it to a friend or loved one who enjoys blades and dragons!